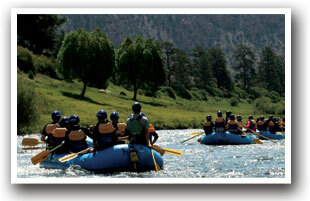 The Arkansas is the most popular whitewater river in America and it is open for rafting from May though September. This 100-mile stretch of water flows through the spectacular Browns Canyon National Monument and is used by more than 400,000 rafters, kayakers, fishermen, campers and wildlife viewers each year. The Arkansas River has an average gradient of 38 feet per mile. The Arkansas River is divided in three different sections. The upper section, the Bighorn, flows by the Cotopaxi cliffs. As you cruise down the river, you will experience geological formations and views of the Sangre de Cristo mountain range. Bighorn Sheep are commonly seen as you raft down the river. These rapids are classified as III-IV rapids. Continuing down the river to the Royal Gorge section that features giant waves, steep technical drops and almost continuous whitewater through the narrow canyon of the Royal Gorge. As you adventure though some of the most challenging whitewater you'll find, you may not even notice the Royal Gorge Bridge 1053 feet above the river. To traverse this section, you must be in good physical shape to navigate the class IV-V rapids. Arkansas Headwaters Recreation Area is one of the nation's premier recreation areas. Stretching for 152 miles along the Arkansas River, the area offers abundant and outstanding opportunities for rafting, kayaking, picnicking, hiking, fishing, mountain biking, and sightseeing among deep canyons, broad valleys and towering mountain peaks. The Arkansas River is very popular for private and commercial boaters alike. There are many public areas easily accessible from the area's highways, some require a hike. BOATING ACCESS POINTS: Along Highway 50 from Mile Marker 100 to 119 are Pinnacle Rock, Salt Lick, Five Points, Spikebuck, Parkdale, Pink House, Centennial Park and River Station. Along Highway 24 from Mile Marker 0 to 119 are Lake Fork, Crystal Lakes, Hayden Meadows, Kobe, and Granite. Along Highway 24 from Mile Marker 14 to 32 are Granite, Clear Creek North & South, Numbers Launch Site, Riverside, Railroad Bridge, Buena Vista. Along Highway 24 from Mile Marker 36 to 52 are Fisherman's Bridge, Ruby Mountain, Hecla Junction, Stone Bridge. Along Highway 50 from Mile Marker 60 to 72 are Salida Boat Ramp, Salida East, Rincon. Along Highway 50 from Mile Marker 80 to 96 are Vallie Bridge, Trading Post, Lone Pine, Fernleaf Gulch, Texas Creek, Maytag. 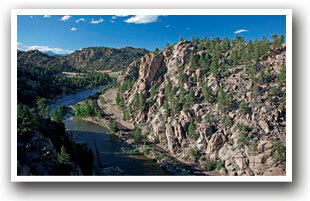 Browns Canyon is the last section of the Arkansas River, which runs near the Buena Vista area. This section of the river is tamer than the other sections and is more suitable for all ages with class III-III+ rapids.